At the Angelus Francis reflects on the mystery of the one God in three Persons: "We renew the mission of living communion with God and with one another on the model of the Trinity." Remember "for what purpose, for what glory we exist, we work, we suffer." Next Thursday the celebration of Corpus Christi: "Participate in this solemn public act of love for Jesus among the people." The Pope calls on those present in the square to make the sign of the cross, all together. Vatican City (AsiaNews) - The mystery of the Trinity "renews our mission to live in communion with God and with one another. It is the ultimate goal of our earthly pilgrimage and gives us the strength to evangelize not only in words, but with the power of God who dwells in us”, said Pope Francis before the Angelus prayer in front of a St. Peter's Square packed with faithful. Today, the Pope began, "we celebrate the feast of the Holy Trinity, which reminds us of the mystery of the one God in three Persons: the Father, the Son and the Holy Spirit. The Trinity is a communion of Divine Persons which are One with the other, for each other, in each other: this communion is the life of God, the mystery of love of the Living God. Who revealed this mystery? Jesus. He spoke of God as Father and he spoke of the Spirit, and spoke of Himself as the Son of God. " After the resurrection, said the Pope, again when Jesus sent his disciples to evangelize people, he told them to baptize "in the name of the Father and of the Son and of the Holy Spirit" (Mt 28:19). Christ entrusted this command to the Church in every age, which inherited the missionary mandate from the Apostles. He also addresses it to each of us who, by virtue of Baptism, are part of her Community. " So, today’s liturgical solemnity "as we contemplate the wonderful mystery from which we come and towards which we go, we renew the mission of living communion with God and among ourselves on the model of the Trinity. We are called to live not one without the other, on or against the other, but with each other, for each other, and in each other. This means to welcome and agree to testify to the beauty of the Gospel living shared love towards all, sharing joys and sufferings, learning to ask for and grant forgiveness, valuing the different gifts under the guidance of the Pastors. In a word, we are entrusted with the task of building church communities that are more and more families able to reflect the splendor of the Trinity and to evangelize not only with words, but with the power of God who dwells within us ". 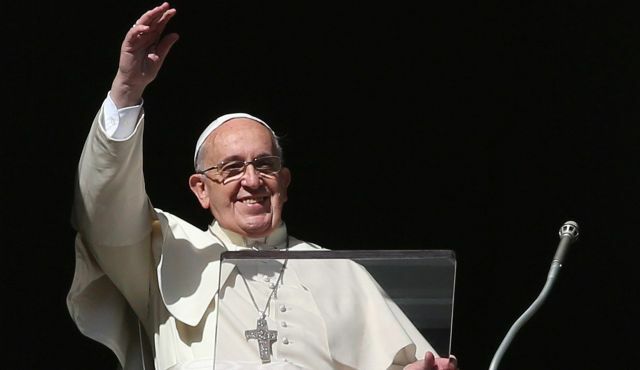 The Trinity, Francis adds, "is also the ultimate goal toward which on our earthly pilgrimage is directed. The journey of the Christian life is indeed an essentially "trinitarian" journey: the Holy Spirit leads us to the full knowledge of the teachings of Christ, of his Gospel and Jesus, in turn, came into the world for us to know the Father, to guide us to Him, to reconcile us with Him. Everything in the Christian life, revolves around the mystery of the Trinity and is unfolds in order of this infinite mystery. Let us, therefore, keep up the "tone" of our lives, reminding ourselves towards what end, for what glory we exist, we work, we struggle, we suffer; and the immense prize to which we are called”. The Pope called on those present in the square to make the sign of the cross together. Immediately before starting the prayer, Francis pointed out that "in the last day of the month of May, the month of Mary, we entrust ourselves to the Virgin Mary. She, more than any other creature has known, lived, loved the mystery of the Holy Trinity, may she lead us by the hand; help us to grasp in world events the signs of the presence of God, Father, Son and Holy Spirit, help us to love the Lord Jesus with all our heart, to walk towards the vision of the Trinity, the wonderful end of our lives. We ask her to also help the Church, mystery of communion, always to be a welcoming community where every person, especially the poor and marginalized, may find acceptance and feel themselves a child of God, desired and loved. " After the Marian prayer and greetings to groups and pilgrims present in the square, the Pope recalled that next Thursday in Rome "we will mark the traditional Corpus Christi procession. At 19 in St. John Lateran I will celebrate Mass, and then worship the Blessed Sacrament processing to the square of Saint Mary Major. I invite you here and now to participate in this solemn public act of faith and love for Jesus in the Eucharist, present among his people. I wish you all a good Sunday. Please do not forget to pray for me. Have a good lunch and goodbye”.